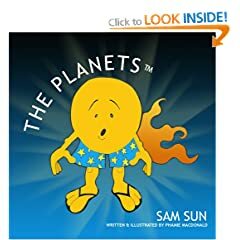 Sam Sun is the first in a new self-published series, The Planets, by Phamie Macdonald. Have you ever heard of solar wind, a stream of charged particles—a plasma—ejected from the upper atmosphere of the sun? Well, poor Sam Sun has a bad case of solar wind. Strange basis for a story, indeed. Macdonald has come up with a unique way to introduce the solar system to young children. During this first story we meet Vicky Venus, the postmoon, and Uncle Halley (as in Halley’s comet). As I read, I laughed a lot and couldn’t help but be reminded a little of the Mr. Men series I grew up reading (that’s a good thing). The illustrations are bold and bright, enticing for any young reader. I think Sam Sun is so much fun and anyone with a good sense of humor will agree.